Whimbrel Nature: Happy New Year! 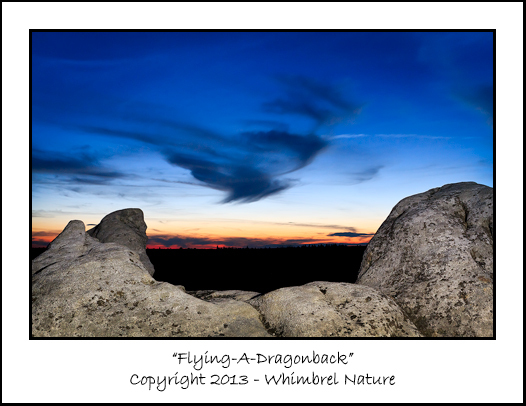 Photographed late during evening twilight from the top of the formation sometimes known as "The Dragon" with my Canon 7D and a Canon 24mm f/1.4 lens. In this single 30 second exposure at f/14 and ISO 400, I painted the light onto the rocks, which were in shadow, with an LED headlamp. Finally a new post. I've been away so long, it really feels like I'm restarting. I can honestly say I'm glad to see the back of 2012 and hope that 2013 turns out a lot better. I'm still actively fighting the Lyme and Bartonella, and as of the end of August I was diagnosed with babesiosis as well. Being back at work has been wonderful and exciting, but also incredibly draining. Recently I've had to drop down to 80% time because my trajectory was just unsustainable. I'm still fighting almost constant pain and fatigue and by the time I finished my "work" day (not counting grading and prep work), I would just come home and completely crash (often curled up in the fetal position in intense pain and sensory sensitivity). I've needed my weekends, and any nights I've been feeling decent, to catch up on work, rest, and devote some functional time to my family. All this is by way of a long-winded apology/explanation for why it has been so long from my last post (here or on Twitter or Facebook). However, I need to start coming back to my photography, in whatever way I can handle. All work and pain, and no play, definitely makes Elijah a dull and extremely miserable boy. So I thought I'd start by sharing a couple of experimental images I took at the very end of August before I returned to work. I've been experimenting with doing more night photography and these are some of my fledgling efforts. I know I've got a lot to learn in terms of technique (and some improvements to make in equipment) before I really master this art form. But I can tell you that it is a heck of a lot of fun! Spending the night all alone, in the dark, among the stone piles of Bear Rocks at Dolly Sods, WV was one of the best outdoor experiences of my life (and okay, I'll admit it, at times a bit creepy). I finally had to pack it in early in the morning, as my lens hit the dew point and started to fog up. So I crawled into my car to sleep. I had wanted to get heat packs to wrap around the lens, but do you know how hard it is to find heat packs in August? Around hunting season I'd find them in every gas station and convenience store in WV, but in August, not so much... But I did set my alarm for sunrise and went back out to photograph the sunrise to the accompaniment of a nearby black bear roaring (I'm not kidding). I'll share more images from this trip soon. And hopefully I'll get out soon to do some more night photography using what I've learned from my mistakes. The clear, cold, haze-free winter skies sound promising, but the freezing temps and wind (particularly given my current condition) sound less so. Happy new year to all and I hope this finds you well! 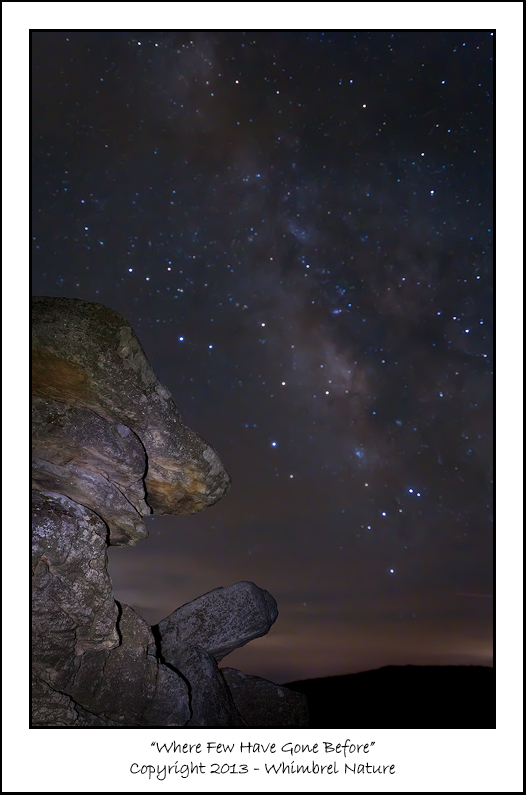 The Milky Way as seen from Bear Rocks, Dolly Sods, WV. Composite of two images taken in the same spot on my Canon 7D with a Canon 24mm f/1.4L lens. The first image to capture the Milky Way was exposed for 20 seconds at f/2.8 and ISO 1600. The second image to capture the silhouetted rocks that were light painted with a headlamp was exposed for 20 seconds at f/16 and ISO 1600. I've missed your posts Elijah, a warm welcome back! I'm sorry to hear about your health and I hope that 2013 is a much better year for you. I love your night time image, that is wonderful and inspiring! So sorry to hear about your health issues, Elijah! I do hope you are now on the mend. Lovely night photographs! I always enjoy studying your photographs and reading about your methods. I've really learned a lot. Looking forward to viewing more of you night time images! Wishing you a HEALTHY, happy new year filled with joy. Glad you're back! Thanks for the posts.